Composer. Nationality: British. Born: William Turner Walton in Oldham, Lancashire, 29 March 1902. Education: Attended Cathedral Choir School, Christ Church College, Oxford, sent down; lived with the Sitwell family for fifteen years. Family: Married Susana Gil Passo, 1946. Career: 1923—composed Facade , to poems by Edith Sitwell, other works include The Viola Concerto , 1929, Belshazzar's Feast oratorio, 1931, coronation marches for King George VI and Queen Elizabeth II; 1935—composed first symphony; first film score, Escape Me Never . Died: On the island of Ischia, 8 March 1983. Craggs, Stewart R., William Walton , Oxford, 1977. Walton, Susana, William Walton: Behind the Facade , Oxford, 1988. Kennedy, Michael, Portrait of Walton , New York, 1998. Craggs, Stewart R., editor, William Walton: Music & Literature , 1999. National Film Theatre booklet (London), July 1982. Obituary in Variety (New York), 16 March 1983. Séquences (Montreal), no. 112, April 1983. New Statesman , 25 March 1988. Score (Lelystad, Netherlands), no. 75, June 1990 + filmo. American Heritage , October 1998. 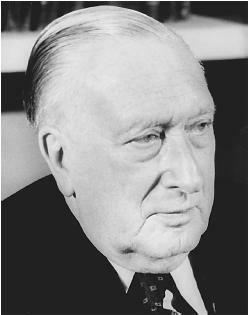 William Walton was born in Oldham, Lancashire. His father was a choir-master and singing teacher and his mother had a fine contralto voice. By the age of 12 he was already composing music of his own and attended Christ Church Cathedral School in Oxford. He quickly made his name as a composer during the glittering 1920s and was friend and confidante of Siegfried Sassoon, Constant Lambert, George Gershwin, Sir Thomas Beecham and Diaghilev. All in all he composed the music to 14 films beginning in 1935 with a score for Escape Me Never , but he did not capture attention for his film work until the 1942 film The First of the Few with its famous "Prelude and Fugue for Spitfire." What marked him out for special attention and acclaim were the scores he wrote for three of Laurence Olivier's films, the most illustrious of which was for Henry V . It has been highly praised by music critics both as film music and as a concert suite in its own right. When the film was released in 1944, many music critics published detailed reviews of the score and extracts of it were presented at the Promenade concerts in 1945. Olivier's enchanting and spectacular historical pageant version of Shakespeare's patriotic epic is as memorable for Walton's sumptuous and rousing music as it is for its magnificent acting, directing, photography, sets and costumes, and most especially for the stirring music for the French cavalry charge at Agincourt. Walton's second collaboration with Olivier on a Shakespeare adaptation— Hamlet —was once again completely interlocked with the director's perception of it. The mime within a mime scene has the soundtrack devoted to Walton's music. The third film with Olivier, Richard III , was remembered by Walton as "the fruit of mutual confidence and esteem." His final collaboration with Olivier came in 1970 when he wrote the score for Three Sisters where the music has a distinctly mellow, autumnal and muted feel to it in keeping with the tragic dimensions of the play. The year before, Walton had written the music for the film Battle of Britain but the score was not considered commercial enough and in the end only a small part of the original score was used—the "Battle in the Air" sequence—and for many years United Artists refused to release the original score for performance in spite of anguished letters from Walton's fans. Walton is one of this century's most celebrated British composers—he said of his contribution to cinema; "The value to a film of its musical score rests chiefly in the creation of mood, atmosphere, and the sense of period." No other British composer has given greater value to the films he worked on.